Many pup parents know all too well: it’s not just humans who can suffer from seasonal allergies. Our dogs’ health and happiness is our top concern, and seeing them uncomfortable – from gnawing at itchy paws to bouts of sneezing – breaks our hearts. Luckily, once the allergies are identified, they can be easily remedied; but we do need to know a little bit about the cause and treatment in order to help our loyal friends. We at iHeartDogs asked Dr. Michel Selmer, DVM, CTCVMP, about natural ways to treat seasonal allergies. Also known as “The Caring Vet,” Dr. Selmer is a Certified Veterinary Food Therapist (CVFT) who uses principles from Traditional Chinese Veterinary Medicine (TCVM) to treat his patients. If you suspect your dog has allergies or any other health issue, always consult with your vet before starting any kind of treatment. 2. Bromelain and Papain are digestive enzymes that help Quercetin work better by increasing its absorption from the intestines. They also have antihistamine and anti-inflammatory properties. 3. Omega-3 fatty acids are anti-inflammatory. Fish oils are great sources to add to the diet. Just don’t add these to the diets of dogs that have gooey, damp lesions (this tip is from the world of Traditional Chinese Medicine). 4. Lauric acid, found in coconut oil, has anti-inflammatory properties just like fish oils but can also help to decrease the population of yeast. Again, do not use damp, gooey supplements on damp, gooey skin lesions. We want to thank Dr. Selmer for sharing his knowledge with us. 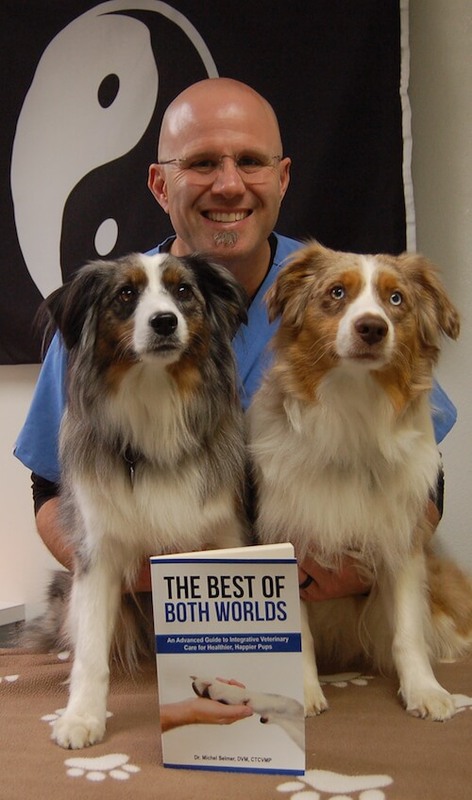 If you want to learn more about taking a holistic approach to your pet’s healthcare, check out his book The Best of Both Worlds: An Advanced Guide to Integrative Veterinary Care for Happier, Healthier Pups. You can also check out his website and follow him on Facebook.